“One data set. Three views. One conversation with multiple talking points. The above quote from Andy comes from a series of events in which three different people took the same data set and told three different stories through data visualizations. The data had been seen thousands of times, but each person examined it with a different perspective and turned it on its head. And the stories told had a tremendous impact in three unique ways. With the new year, I wanted to be more intentional about creating opportunities to have an impact by telling stories. I wanted to focus on ways that people could be moved by stories told with data, knowing that when you put the two together, you multiply the effect of both. I hope to grow in many ways this year, but one of my main focuses is on data storytelling. Given all of this, I have partnered with Alex Duke and Matt Chambers on this journey that we are calling the Reviz Project. The project seeks to systematically do what happened by chance back in 2014—take a common data set and have its story told in at least three different ways. The goal is to change the way we look at the world and the way we look at data, and to see the humanity in both. It is our intent not just for us to chase after this; rather, we invite the community to join in as well. Here are the details. Each month, there will be one leader and two followups. In the first week, the leader will prepare an open-source data set for the team and the community to use. This will be the main data source. The leader will publish his or her viz on Tableau Public and the data on the Reviz blog. It is highly encouraged that the leader blogs about the creation process (data collection and vizzing techniques). The followups are required to use the same data set published by the leader to create a viz that tells a story that is different from the leader's. Community members are invited to use the published data to tell their own story. Visualizations that are submitted by the end of week four will be featured on the community page of the Reviz blog. Each of us have our reasons for taking this on. For Matt Chambers, the Reviz Project is about perspective. “It allows us to take a data set and tell different stories from different perspectives with data visualization. We no longer have to rely on the stories that are being told in the media; if the data is available, we can find our own stories,” he says. Personally, I view data as the “what.” Unadulterated and raw, it is the reality. Data needs a story to bring it to life. By asking the question “why?” we begin to breathe life into the data, which brings about the opportunity for assumptions to change and perspectives to shift. Focusing on the why has brought about some of my most impactful work and has truly changed the way I see the world in the day-to-day. It humanizes the data and creates emotion based on fact. 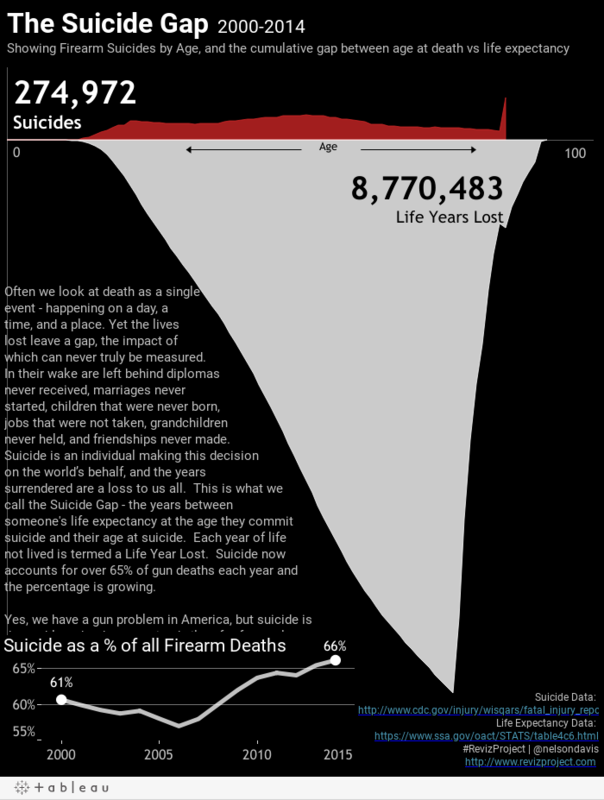 I knew I wanted to show the impact, and make the audience FEEL the loss of years to gun deaths, but it was after seeing Matt’s viz that I decide to focus only on suicide. Suicide touched my life back in high school and had a big impact. Alex and I had taken Matt’s work and found new stories to tell. The best part was that the community was up to the challenge as well. We received a number of revizzes during the last week of January, including one from Tableau’s own Ben Jones. Now it’s your turn to get involved. Alex is taking the lead for February and she’s got us focused on human trafficking—the stories of lives sold into modern-day slavery. It’s beyond heartbreaking, yet many of us don’t see the effects of this cruel trade. Our goal will be to show that impact. We’d love for you to join us by downloading the data and telling your own story. Who knows the impact you might have? For more information on the Reviz Project, visit the project's website and follow the Twitter hashtag #revizproject. Have you thought about adding data for overall suicide rates by state? While gun deaths by suicide may be lower in states that have more gun laws, is it possible that overall deaths by suicide don't correlate to gun laws? In other words, people may choose another means to end their life if they can't get a gun. Or to ask a different but related question...are suicide rates lower in states that have more gun laws? And just like the article states- this spurs a thousand new questions (which is great! ): What are mental health facilities like in these places? Are the high suicide and violence areas also located in places where there is social unrest? What exactly is making people suicidal? Are there a disproportionate number of any certain ethnic group, gender or age being affected? 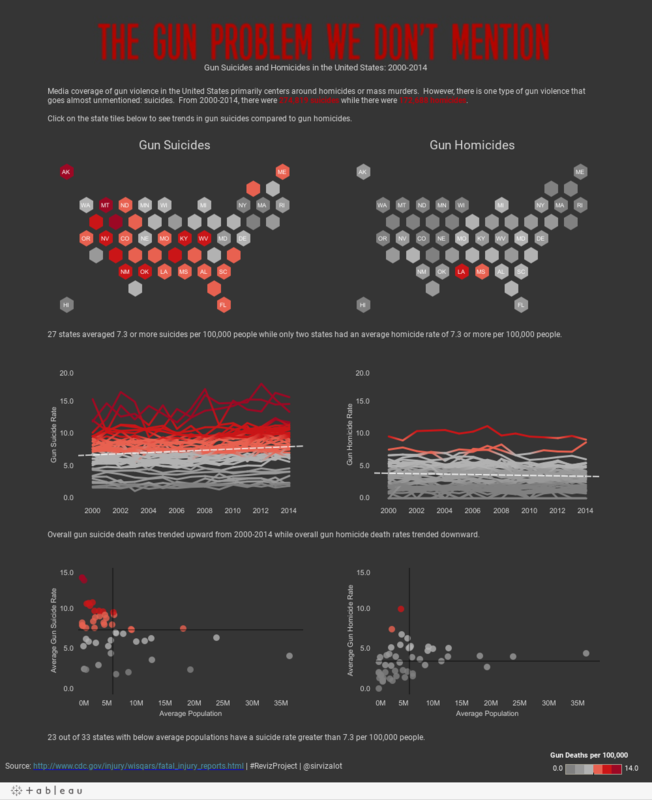 1) I'd be much more comfortable with your "GUN LAW RANK vs SUICIDE RATE" viz if you had a continuous X variable. I'd still probably question the methodology as to how that measurement was determined, but the viz wouldn't bother me. 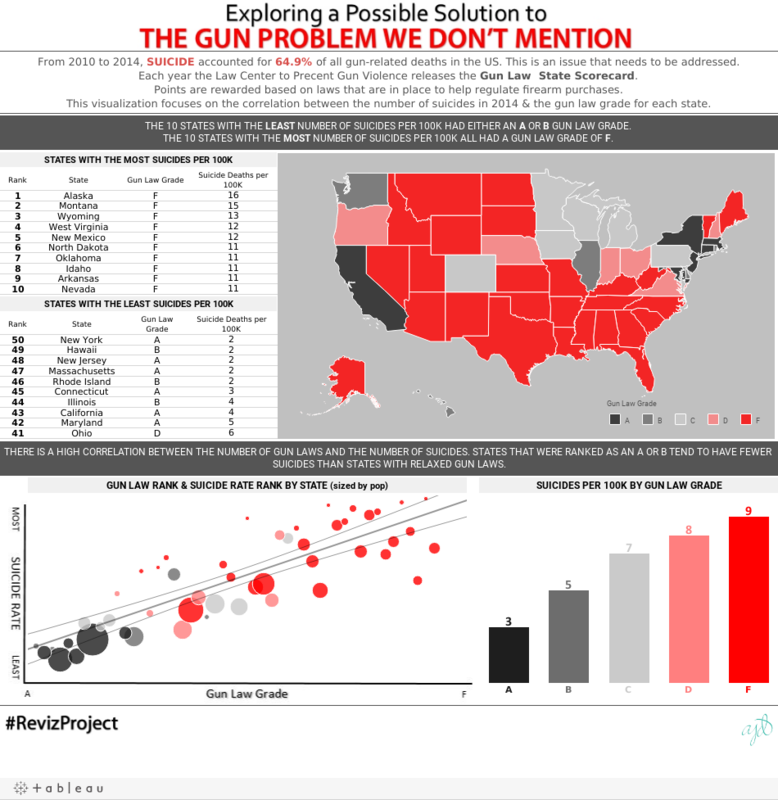 2) You don't address the number of gun deaths attributed to neither suicide or homicide. Cursory analysis might suffice, but without it your analysis feels incomplete. It is beautiful in itself and it doesn't need any decorative piece to accentuate its beauty. Congrats Nelson! They seem perfect for a good start for storytelling - and visuals have to support that!